For other people with similar names, see Daniel Devine (disambiguation). Daniel John Devine (December 22, 1924 – May 9, 2002) was an American football player and coach. He served as the head football coach at Arizona State University from 1955 to 1957, the University of Missouri from 1958 to 1970, and the University of Notre Dame from 1975 to 1980, compiling a career college football mark of 173–56–9. Devine was also the head coach of the National Football League's Green Bay Packers from 1971 to 1974, tallying a mark of 25–27–4. His 1977 Notre Dame team won a national championship after beating Texas in the Cotton Bowl. Devine was inducted into the College Football Hall of Fame as a coach in 1985. Born in Augusta, Wisconsin, Devine later went to live with an aunt and uncle in Proctor, Minnesota. As a star at Proctor High School, Devine started at quarterback as a freshman and later became known as "The Proctor Flash," a name given to him by his friend Lute Olson. He also competed in three other sports during his four years at the school, and graduated in 1942. Devine then enrolled at the Duluth State Teachers College (now the University of Minnesota Duluth), and was team captain of both the basketball and football teams, playing as a 170 lb. (77 kg) quarterback. His time at the school was interrupted after his enlistment in the Army Air Corps during World War II, where he became a B-29 flight officer. He graduated from college in 1948 with a bachelor's degree in history. Devine earned his first coaching job as head coach at East Jordan High School in Michigan, reaching his interview by a combination of bus travel and hitch-hiking. Following two undefeated seasons at the school, he accepted an assistant position at Michigan State in 1950 under legendary coach Clarence "Biggie" Munn. For the next five seasons, he helped the Spartans achieve success, including winning a national championship in 1952. On February 5, 1955, Devine accepted the head coaching position at Arizona State College, now Arizona State University, in Tempe, Arizona. Joining him as an assistant was Frank Kush, who would have even greater success at the school after Devine's departure. During his three years with the Sun Devils, Devine compiled a record of 27–3–1 (.887), including a spotless 10–0 mark during his final campaign. In that last season, Devine's team led the nation in total offense and scoring, averaging just under 40 points per game in the latter category. His success at Arizona State resulted in an offer from the University of Missouri, which he accepted on December 18, 1957. At first, Devine was reluctant to accept the position; his flight to Missouri had developed engine trouble. In addition, Devine had hot chocolate spilled on him by a stewardess during the flight, which arrived six hours late. Over the next 13 years, Devine would turn the once-dormant program into a consistently competitive school that finished with a Top 20 ranking nine times. His record of 93–37–7 (.704) included four bowl game victories, with his winning percentage passing that of Don Faurot, the legendary coach who had preceded him. He left Mizzou as the second winningest coach in school history, behind only Faurot. He is now third after Gary Pinkel passed him in 2013. After finishing 5–4–1 in his first year in 1958, Devine (with two years left on his contract) gained some job security when a group of Mizzou alumni funded a $150,000 life insurance policy that covered him as long as he remained as head coach of the Tigers. The investment paid off as Missouri never lost more than three games over the next decade. In 1960, the Tigers began the year unranked, but after shutting out SMU 20–0, in the season opener, moved up to 16th and continued to head upward in the weekly rankings. Following that win with eight straight victories, Missouri became the top-ranked team in the country following a 41–19 victory over Oklahoma. Needing only a victory over Kansas to clinch a national championship, the Tigers (favored by a touchdown) instead were stunned in a 23–7 upset loss. After an Orange Bowl victory over Navy on January 1, 1961, Missouri finished the year ranked fifth in a season which saw upwards of four teams claim a share of the national title. The loss to KU was later reversed after an investigation revealed that the Jayhawks' Bert Coan had received illegal benefits and was thus ineligible. Missouri claims the 1960 game as a win by forfeit—thus making 1960 the only undefeated and untied season in school history. 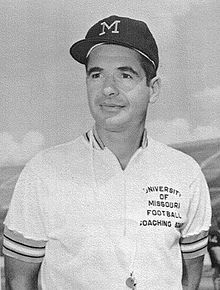 While never again reaching that level, Missouri maintained its strength throughout the 1960s, with Devine taking on the added duties of athletic director in 1967 after Faurot stepped down from that post. During his three years in the latter role, he made a key hire when he selected Norm Stewart to head the fortunes of the school's men's basketball squad. After finishing 9–1 in 1969, a season capped off with a massive 69–21 win over KU that saw Jayhawk coach Pepper Rodgers showing the peace sign to Devine late in the game and Devine "return half of it", Missouri faced Penn State in the 1970 Orange Bowl. The Nittany Lions entered the game with a 28-game winning streak, and extended the string by intercepting seven Tiger passes in a 10–3 defensive battle. After suffering his first losing season in 1970, Devine departed on January 14, 1971, to become the head coach and general manager of the Green Bay Packers of the NFL, succeeding Phil Bengtson. Devine acknowledged the pressure of the position, but had the benefit of not immediately following legendary coach Vince Lombardi. Bengtson had endured three years of unrealistic expectations following Lombardi's brief retirement after Super Bowl II. Devine's career in Green Bay got off to a painful start when he suffered a broken leg following a sideline collision in the season opener, a 42–40 loss to the New York Giants. After finishing 4–8–2 in 1971, Devine headed a brief resurgence that "The Pack is Back," by dethroning the four-time division champion Minnesota Vikings in 1972 to reach the playoffs, the Packers' first post-season in five years. The Packers lost 16-3 in the first round to the Washington Redskins at RFK Stadium on Christmas Eve. The Packers would not reach the post-season for another decade, during the expanded 16-team playoffs of the strike-shortened 1982 season. Green Bay would not return to the playoffs in a non-strike year until 1993. Unable to recapture the success of 1972, Devine's final two seasons at Green Bay were disappointing (5–7–2 in 1973 and 6–8 in 1974). Midway through his last season as Packers head coach in 1974, Devine traded two 1st round picks, two 2nd round picks, and a 3rd round pick for 34-year-old quarterback John Hadl from the Los Angeles Rams. The Packers were 3-3 at the time despite lackluster play from quarterback Jerry Tagge, and Devine apparently believed an experienced quarterback was the last piece of the puzzle. Hadl played only two years as a Packer, winning only seven games and throwing 29 interceptions in that time. Meanwhile, the Rams used the picks acquired in the trade to draft players who would help them dominate the NFC West in the 1970s. To this day, many Packer fans have never forgiven Devine for the trade, which is widely reckoned as the worst trade for a starting quarterback in NFL history. The Packers would not have another true franchise quarterback until the arrival of Brett Favre in 1991. On a personal note, Devine's wife was diagnosed with multiple sclerosis during the season. After a three-game losing streak knocked the Packers out of the playoffs, Devine resigned on December 16, 1974, to become the head coach at the University of Notre Dame. Devine had been a leading candidate for the head coaching job at Notre Dame in 1964, when Ara Parseghian was hired. When approached for the job following Parseghian's resignation, Devine accepted immediately, joking that it was probably the shortest job interview in history. In his six seasons at Notre Dame, Devine compiled a 53–16–1 mark (.764). His lasting achievement came midway through this run, when the Fighting Irish won the 1977 national championship, led by junior quarterback Joe Montana. The regular season was highlighted by the Irish's 21-17 come-from-behind win over Clemson at Death Valley, when Devine repeatedly gave the middle finger salute to the raucous home crowd. The championship season was completed with a convincing 38-10 win in the 1978 Cotton Bowl Classic over previously top-ranked Texas, led by Heisman Trophy winner Earl Campbell. The win vaulted the Irish from fifth to first in the polls. Earlier in the season, before the annual game against USC, played at home on October 22, Devine changed the team's jerseys from navy blue & white to kelly green & gold, which would remain for the rest of his time at the school. He also added names to the players' jerseys on a permanent basis when he took over at Notre Dame. Previously, names had been included on jerseys only during bowl games. (The traditional navy blue & white jerseys without names returned in the 1980s under Lou Holtz.) Devine's teams won three bowl games, including consecutive Cotton Bowl Classics. In the 1979 Cotton Bowl Classic, the Irish trailed 34–12 with 7:27 remaining in the game. They rallied for 23 unanswered points behind ailing senior quarterback Joe Montana for an incredible 35–34 victory over Houston. The game became part of college football folklore, referred to as the Chicken Soup Game. Because he had the unenviable task of following a legend, Devine came under heavy scrutiny while at Notre Dame and it was felt that he was never fully embraced by the Notre Dame community, despite winning a national championship. After a 5–2 start in his first season, rumors of incompetence were circulated and that Devine would be dismissed and replaced by Don Shula or even Ara Parseghian (who went so far as to say he would not return to Notre Dame under any circumstances). Even on the day of the 1977 USC game, "Dump Devine" bumper stickers were being sold outside Notre Dame Stadium. He also had the notoriety of losing to his old program, a shocking 3–0 loss to the Tigers at South Bend in 1978. It wasn't until after Devine had left Notre Dame that fans began to appreciate him. Like Joe Kuharich before him, Devine was involved in a game while at Notre Dame whose ending resulted in a rule change still in effect today. On September 15, 1979, the Irish faced the Michigan Wolverines in Ann Arbor in their season opener. With six seconds remaining, Michigan lined up for a game-winning field goal attempt. Notre Dame linebacker Bob Crable climbed up onto the back of opposing long snapper Mike Trgovac and was able to block the kick, preserving a 12–10 Irish victory. A new rule was implemented the following season that prohibited this tactic. On August 15, 1980, Devine announced that he would be leaving Notre Dame at the end of the 1980 season, saying he wanted to be able to spend more time with his wife. Notre Dame named Gerry Faust as Devine's successor on November 24, 1980. At the time, Devine's Irish were enjoying a surprisingly successful season, with a 9-0-1 record and No. 2 ranking in the polls, behind only Georgia, who the Irish would be playing in the Sugar Bowl. However, after Faust's hiring was announced, Notre Dame lost its regular season finale at arch-rival Southern Cal, 20-3, and then lost the Sugar Bowl to Georgia, 17-10, giving the Bulldogs their first national championship and spoiling Devine's last game as a head football coach. Devine moved back to Arizona and became a fundraiser for Arizona State's Sun Devil Foundation. In 1985, he was elected to the College Football Hall of Fame, and then returned to his old school at Missouri seven years later as athletic director to help navigate the school through financial troubles. Devine was inducted into the inaugural class of the University of Minnesota Duluth Athletic Hall of Fame in 1991. In 2000, Devine's wife died. His own health began to deteriorate in February 2001, when after undergoing heart surgery, he suffered a ruptured aorta. Fifteen months later, he died at home. Devine was portrayed by actor Chelcie Ross in the film Rudy. In the film, Devine is portrayed in a somewhat unfavorable light, acting as a hindrance to Daniel Ruettiger's dream of dressing for one game with Notre Dame. Devine was reported to be extremely angry with how he was portrayed in the film noting that he had planned to allow Rudy to play all along. He also maintained that none of the players laid down their jerseys on his desk as a form of protest and if anyone had, they would have been kicked off the squad. Devine was asked by movie producers to allow his dramatized character to "play the heavy," to make the movie better. While Devine agreed, he later wrote that he didn't believe Ross' portrayal would be as antagonistic as it turned out in the finished film. ^ Beacom, Mike (October 21, 2011). "A look back at the Hadl trade". Pro Football Weekly. Archived from the original on December 24, 2011. ^ Litsky, Frank (May 10, 2002). "Dan Devine, Football Coach, Is Dead at 77". The New York Times. Retrieved February 9, 2014.